Her story is not a new one. A hopeful actress battling her weight, her sexuality, and her desire for fame in an epic battle that ends almost the same way every time. Anorexia, bulimia, and the pressure to be thin show battle wounds on several of Hollywood’s leading ladies; however, for Portia de Rossi, anorexia was thought to be more of a friend than an enemy. 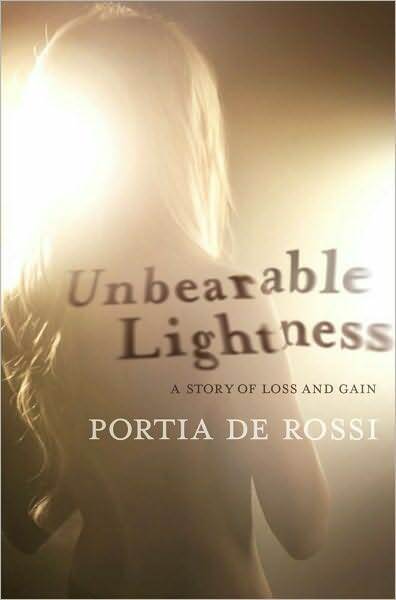 “Anorexia was my first love,” she declares in her memoir, Unbearable Lightness. Her unflinching and honest self-portrait tells the story of a young Australian girl trying to make a name for herself in a town with too many names. Never comfortable in her own skin and never content with her sexuality, de Rossi found comfort and control in monitoring her weight. Eventually, as is often the case, the dieting, binging, and starvation became a sickness that almost killed her. It wasn’t until 2001, when she met her dear idol Ellen DeGeneres, that things began to look up for this little Aussie lass. Although many of her stories are everyone’s stories, de Rossi speaks to her readers with brutal honesty and sincerity. As we learn more and more about her rituals, her falls and successes, we can’t help but root for her and cheer her on as she continues (to this day) to improve her life. This is a story with a happy ending…and hopefully a very happy beginning. Although more talk of her life after marriage and her work on shows like Arrested Development and Better Off Ted would have been gladly welcome, Unbearable Lightness serves it’s purpose greatly…a journal of love, loss, and acceptance. NEXT WEEK: A beautiful tribute to a man we all knew and loved…by the woman who loved him the most.